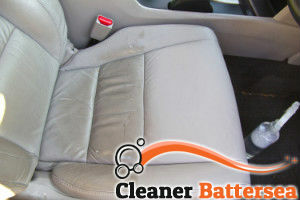 The interior cleanliness of your car is more important than you might think it is. You probably take your car to the car wash regularly or clean it on your own, but it is not only important to clean it on the outside so that it is shiny and impressive to people. It is more important to clean it on the inside because that is where you spend time. If you are not sure how to clean your car interior, please call our company now and book our professional car upholstery cleaning service. We are available here in Battersea. Our company understands the importance of a perfectly clean car interior and we know how to achieve the maximum results in cleaning it. You will be making a smart choice for yourself and your car by booking our service. Our cleaners are competent and knowledgeable in car upholstery cleaning and can efficiently and safely clean any kind of upholstery fabric. Our cleaners will come to clean your car interior prepared and equipped with steam cleaning machines and cleaning agents that are safe to use on the different – wool, vinyl, leather, etc. Whatever your car seats fabric is you can be sure that it will be safely cleaned and deodorised. We promise you that with our steam cleaning method your car seats will be deodorised, all soil and dust will be removed and our cleaners will also remove all stains. Choose our service and you will not be sorry. 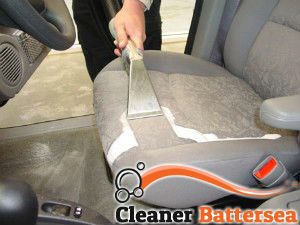 Our car upholstery cleaning service is one-of-a-kind here in Battersea and we have economical prices and various packages available to you. Call us soon.